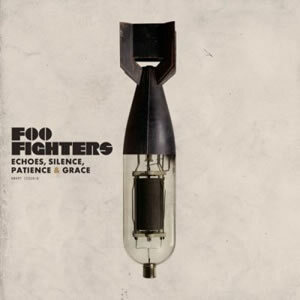 On Echoes, Silence, Patience and Grace, the Foo Fighters made a concerted effort to find a different sound than that on any of their initial five albums. The album contains an alternating blend of acoustic and electric tracks, each with a great sense melody and use of shifting dynamics. Further, the compositions and arrangements are very rich and complex on this album, with leader Dave Grohl citing influences ranging from Steely Dan to Wings to the classic album Odessey and Oracle by The Zombies. The result was an entertaining and rewarding album which found success worldwide. With three albums under their belt at the turn of the century, Foo Fighters changed record labels (moving to RCA) and auditioned for a new lead guitarist, eventually hiring Chris Shiflett. The group struggled to complete their fourth studio album, ultimately recording One by One twice before it was finally released in October 2002. The next album, 2005’s In Your Honor, was more successful and spawned a 2006 tour which was split between electric and acoustic sets, which in turn led to the release of the group’s first live album, Skin and Bones. For the recording of Echoes, Silence, Patience & Grace, the band brought in producer Gil Norton, who had produced the band’s second album The Colour and the Shape a decade earlier. Norton stressed the importance of pre-production and refining the compositions. In turn, group prepared extensively before recording at their independent Studio 606 in California. The album’s leadoff track, “The Pretender”, has a deceptive beginning with a calm, picked electric short intro before the song breaks into a rock frenzy announced by Taylor Hawkins‘ drum-drilling, Aside from a short, 10 second reprise of the intro, the song never relents from this energetic approach. The song was originally brought to the recording sessions as “Silver Heart” but was initially rejected by Norton. Later in the sessions, Grohl redeveloped the song with a more up up-tempo approach which worked to make the song a Top 40 hit. In contrast to the opener, “Let It Die” within the general realm of its calm intro, at least for a respectable measure of time. This song is kind of a bright take on nineties grunge until Nate Mendel‘s thumping bass links to a stronger and more richly arranged section and, although this song never quite hits the frenzied stage, Grohl’s raw, primal scream at the very end gives it an air of pure desperation. “Let It Die” also features former band member Pat Smear on rhythm guitar. “Erase/Replace” makes nice use of rudiments during the choppy verses, while the choruses are very melodic and catchy, especially during the final stanza when Shiflett adds a counter-lead guitar to the main riff. “Long Road to Ruin” follows as a beat driven, pop rocker with thick guitars and an inspiration feel which betrays the negative overall theme and lyrics. As the album unfolds it only gets stronger. The acoustic ballad “Come Alive” has a sparse but interesting arrangement with melodic vocals, especially during the double-tracked sections on the chorus. The second part of the track has a stronger rock presence, while the overall tone and feel persists. “Stranger Things Have Happened” is a solo picked acoustic track by Grohl with a few interesting dynamics added with the simple, overdubbed lead acoustic by Shiflett. “Cheer Up, Boys (Your Make Up Is Running)” may be the most unique track on the album as an upbeat, poppy, nineties-style rocker with effective use of beat and backing vocal effects. Adding further diversity to the album, “Summer’s End” has a Southern rock feel, especially in the twangy but strong guitar riffs and vocal harmonies. While this entire record is solid, the final stretch of Echoes, Silence, Patience & Grace is the most rewarding. “Ballad of the Beaconsfield Miners” is a finger-picked acoustic instrumental, with Grohl playing dueling guitars with guest player Kaki King. “Statues” is beautiful piano ballad with a great melody throughout. This melancholy song of reflection and mortality and, musically, there is not a bad note throughout this exquisite track with piano, accordion, strings and acoustic, laying the ground work for the fine topical melodies, including a short but excellent guitar lead. “But, Honestly” is another top notch song, starting with a bright, strummed acoustic, solo through the first two verses along with interesting backing vocals by Hawkins. The song’s structure makes very effective use of repetition to build the tension before the song finally explodes into a full, frenzied arrangement for the outro. The album concludes with “Home”, a sappy piano ballad but with some definite redeeming qualities, especially the John Lennon-style rapping during the verses and the slight arrangement with strings in the middle. Like much of the album, this song was inspired by the arrival of Grohl’s daughter and his new found domestic bliss, this particular track contains the lyrics which give the album its title. Echoes, Silence, Patience & Grace sold well, with 168,000 copies in just its first week, and won the Grammy Award for Best Rock Album. 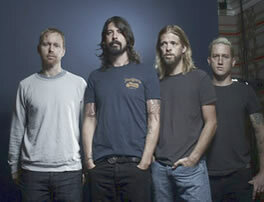 Later in 2007, the band embarked on a world tour, performing in the United States, Canada, Europe, Australia, New Zealand and Asia, a tour on which the Foo Fighters brought Smear back as a permanent member of the band.